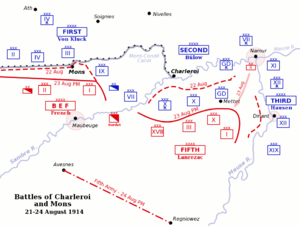 The Battle of Charleroi (French: Bataille de Charleroi), or the Battle of the Sambre (1914), was fought on 21 August 1914, between French and German forces and was part of the Battle of the Frontiers. The French were planning an attack across the Sambre River, when the Germans launched an attack of their own. The Germans were victorious. By 20 August, Lanrezac's Fifth Army had begun to concentrate on a 40-km front along the Sambre, centred on Charleroi and extending east to the Belgian fortress of Namur. On his left, the Cavalry Corps of General Sordet linked the Fifth Army with the British Expeditionary Force at Mons. Lanrezac's army of 15 divisions, weakened by the transfer of troops to Lorraine, was confronted by the 38 German divisions from the Second Army (General Karl von Bülow) and Third Army moving south-west. 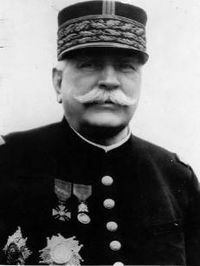 Although Lanrezac knew retreat to be necessary from the beginning of the war and warned against the danger of the German sweep through Belgium, his superior, General Joseph Joffre, believed that France should follow the offensive Plan XVII, regardless of what happened in Belgium, and discounted Lanrezac's warnings and ordered Lanrezac to attack across the Sambre. Before Lanrezac could act on the morning of 21 August, the German Second Army launched the Battle of Charleroi with assaults across the Sambre, establishing two bridgeheads which the French, lacking artillery, were unable to reduce. Bülow attacked again on 22 August with three corps against the entire Fifth Army front. Fighting continued on 23 August when the French centre around Charleroi began to fall back. Meanwhile the German Third Army had crossed the Meuse and launched a frontal attack against the French right, held by a corps commanded by General Louis Franchet d'Esperey. The Third Army attack threatened to cut off Lanrezac's line of retreat but Franchet d'Esperey's force stopped the German advance and delivered a successful counter-attack. However, with the evacuation of Namur and news of the French Fourth Army retreating from the Ardennes, Lanrezac ordered a withdrawal lest he be encircled and cut of from the rest of the French army.